The bedroom benches not only add a new style to your bedroom; these also give additional seating space. These are not only to sit; many of these have storage space to store your essential items. The contemporary bedroom benches are designed to have an up to date style for your bedroom. With stylish design and gleaming adornments, the Wholesale Interiors Baxton Studio Tamblin Bench dares to boast a different and chic look. This high profile bench is built with MDF for optimum endurance and sturdiness. It features a thick filling of fire retardant polyurethane foam that offers optimum comfort when you rest on it. Silver nail head trim outline the profile and button tufts near the arm base enhance the beauty of its overall look. 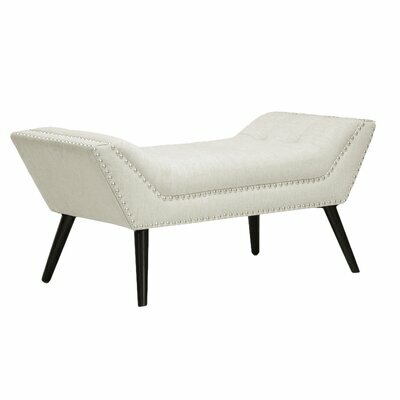 Beige colored upholstery with solid birch legs in black finish. Its delightful appearance is perfect for your contemporary themed bedroom. It is also available in Grey color. Upholstered and accented with nail head trim. Button tufts at the edge of arms. Generously cushioned with fire retardant polyurethane foam. Slanting Birch legs in black finish features non-marking feet. Manufacturer provides 30 day limited warranty for parts only. The Callowhill Wood Bedroom Bench is an exquisite fusion of style and functionality. This versatile bench can be utilized in multiple ways. It provides perfect extra seating space in your entryway, hallway, living room or bedroom. Its sturdy construction with strong frame and stable legs allows it to easily accommodate two people. Two matching pillows complete its look while adding more comfort to the seating experience. The stylish bench features a transitional design that blends beautifully with all types of home decors. You can also add some colorful throw cushions and further perk up the look of this bench. Ten more finishes available including Midnight, Buff, Dijon, Shell, Chocolate, Crimson, Latte, Loden, Mocha and Navy. It can easily accommodate 2 persons easily. Features welted tailoring and solid pattern. Upholstered in easy to maintain 100% polyester micro suede. Solid wood renders strength to the feet for maximum stability and support. Block feet in Espresso finish. 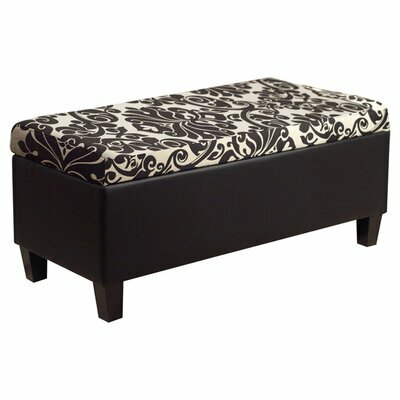 The classy and chic Attles Fabric Bedroom Storage Ottoman is an epitome of style and function. Its foam filled cushion provides comfortable seating space for two people. It provides ample storage space with lift top storage compartment beneath the seat. Built out of rubberwood and plywood, this contemporary styled bedroom ottoman is sturdy and robust to last many years to come. Plywood combats and resists cracking, shrinkage and warping as opposed to many other woods. Together, plywood and rubberwood construction renders additional strength to the ottoman frame. 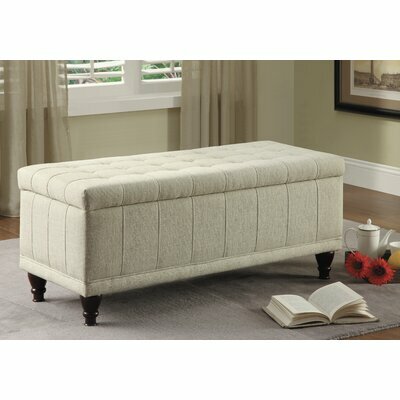 The graceful Attles Fabric Bedroom Storage Ottoman boasts a luxurious look in cream colored microfiber upholstery. Straight line stitching pattern across the panels gives subtle depth to its profile silhouette. Stylish turned legs support and stabilize it and accentuate the overall look. 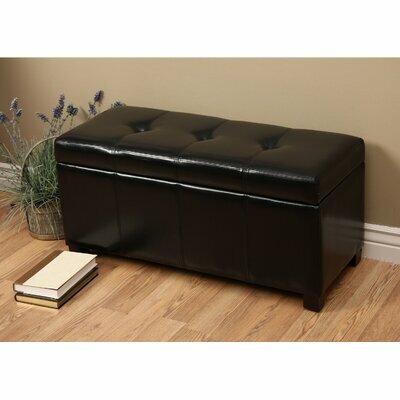 This storage ottoman requires minimal assembly and is easy to maintain. Just use a dry cloth to wipe it clean and avoid using strong liquid cleaners. Manufactured from rubberwood and plywood. Plywood construction is resistant to cracking, shrinkage and warping. Storage space under the top for keeping your throw cushions, pillows and bed linens. Comes with a lift top. Line stitching pattern across panels. Tufted for a classy look. 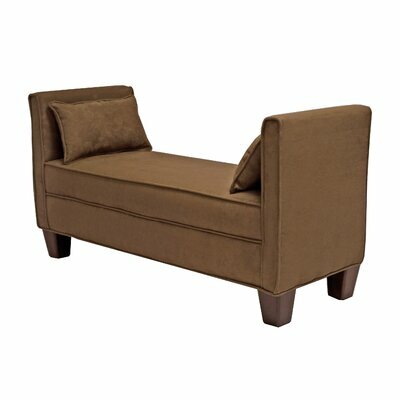 Beautiful turned legs in brown finish support this gorgeous ottoman. Eco-friendly materials are used in its construction. The appealing Ariel Upholstered Storage Bedroom Bench by Warehouse of Tiffany will add a stylish glam to your bedroom décor. This casual contemporary bedroom bench features Oakwood frame and faux leather upholstery in black finish. Button tufts embellishment on durable leather gives it a chic profile. Place it either in your bedroom or entryway and store your household essentials and create a perfect clutter-free space. It can be used as both bedroom and entryway bench. Seven more delightful finishes available including Brown, Dark Blue, Grey, Ivory, Purple, Red and Toffee Brown. Button tufted and upholstered in easy-to-care faux leather. Block feet stabilize and support the bench frame. Beauty and functionality combines immaculately in this stunning Lilac Fields Upholstered Bedroom Storage Bench by PRI. It feature two generously foam filled cushions that are accentuated with button tufts. The cushions have gas lift hinges and open to reveal a roomy storage compartment where you can store your household items. This lovely and stylish bench can also be used as a coffee table ottoman or can be placed at the foot of the bed or in foyer. This bedroom bench is constructed from wood composites and select hardwoods. Two lusciously padded cushions accented with straight line stitching pattern and button tufts. Upholstery fabric material is easy-to-maintain Polyester/Polyester blend. Dual storage compartments offer ample space for keeping your pillows, throw cushions and bed sheets. Includes gas lift hinged tops. Tapered wood legs support the bench. It is very easy to assemble; required tool is screwdriver. PRI provides one year limited warranty on this product. Add a style statement to your home décor with this elegant Wildon Home Northlake Upholstered Storage Bench. This transitional styled bench is a beautiful blend of both traditional and contemporary styles. 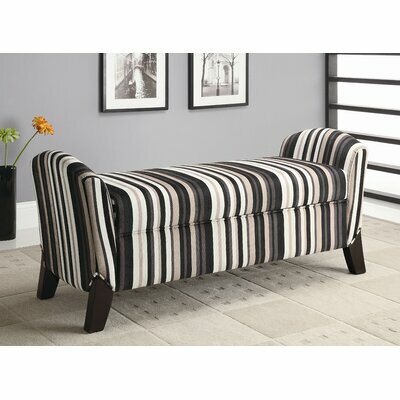 It features plush micro velvet upholstery in a trendy black and brown striped pattern. Upholstered armrests and cappuccino legs accentuate its overall look. The functional and luxurious Northlake Bench provides ample storage space to keep your pillow covers, quilts, bed sheets and linens. You can place this versatile bench in any corner of your home. It is a smart and practical solution that provides you with extra seating space. It can be utilized as both entryway bench and bedroom bench. Upholstered in plush micro velvet fabric. Fabric features black and brown stripes. The upholstery is washable in washing machine. Comes with a flip top storage compartment. The vintage inspired Donna Wooden Bedroom Bench is skillfully crafted to add romantic glam to any bedroom décor. Curved wooden base with exquisite cabriole legs embellish the bench and gives it a classic look. This bench is a classy piece of art that has elegant oak legs in pickled oak finish. 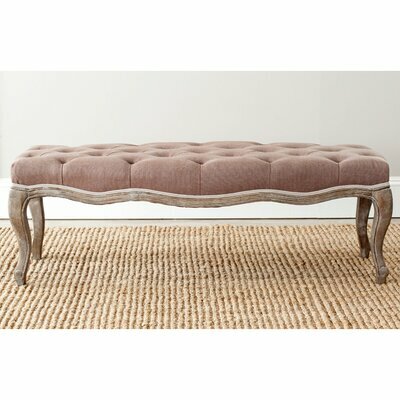 The stunning bench features sand colored upholstery that is very pleasing to the eyes. Its classy and elegant profile will create an attractive visual delight by adding grace to your bedroom décor. This bedroom bench is constructed from Oak wood. Color of the upholstery fabric: Brown. Finish of the base: Oak. Curved base with carved details. 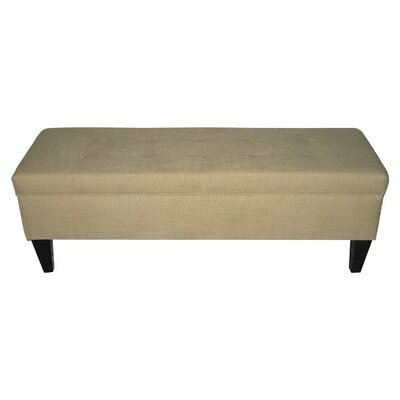 The classic Aarav Upholstered Storage Bedroom Bench is a graceful storage piece. This bench is very comfortable as it is thickly padded with polyurethane and polyester foam. You can store your household items in the hidden storage chamber below the cushion. This quality product is handcrafted in United States of America from solid pine. Solid pine construction renders strength and durability to the bench frame. This lovely bench, with its simple and chic diamond pattern fabric, will prove to be an excellent choice for any bedroom décor. Solid pine construction renders strength and endurance. Upholstered and thickly padded with polyurethane and polyester fill foam. Easy to maintain upholstery fabric made of cotton and polyester/polyester blend. Diamond pattern printed on fabric. Flip top storage space for keeping your household items organized. Bench rests on block feet. Manufacturer provides 8 year limited warranty excluding fabric. 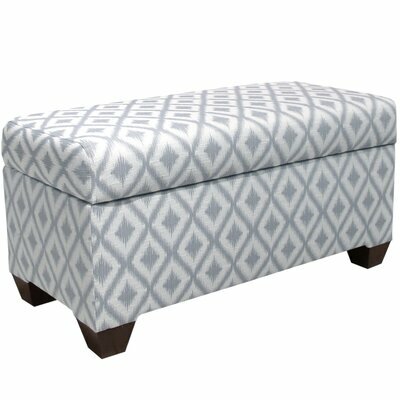 Add style and comfort to your home with the aesthetically appealing Tusarora Upholstered Storage Bench. This comfortable bench is an exquisite combination of style and functionality. It offers ample storage space for a clutter free room. The attractive bench features a delightful contrast of sand colored upholstery with black finished tapered legs that will blend beautifully with most of the bedroom decors. Upholstered in sand colored fabric. Upholstery fabric is a polyester/polyester blend. Cushion is filled with fire retardant foam. Tapered legs in black finish. Flip top storage compartment provides ample space for storing quilt, blanket, pillow covers and any other thing you want. The fashionable Zoe Storage Bedroom Bench by TMS will glamorize your bedroom interior. It is made out of strong wood and steel that render strength and durability to its structure. It has a storage compartment hidden under the hinged lid. Keep your bed linens and quilts in the storage compartment and keep your bedroom clutter free. This stunning bench features a black faux leather upholstered base for a bold and stylish look. The foam filled comfortable cushion is upholstered in black and white fabric with swirling floral pattern to add subtlety to its bold look. With its charming profile, this bench will adorn the grace of your bedroom décor. Manufactured out of sturdy wood and steel. Bench frame is upholstered in black faux leather. Cushion is upholstered in black and white fabric with beautiful floral pattern. The cushion opens to reveal a hidden storage compartment where you can keep your bed sheets and pillow cases. Cushion fabric is polyester/polyester blend. Comes with a lid with safety hinges. This bedroom bench is very easy to assemble. Product Care: Use a dry cloth to wipe it.